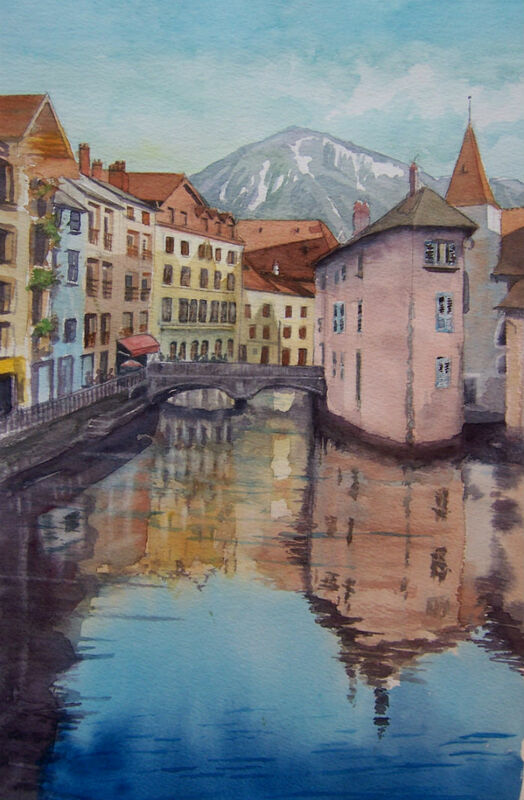 I’ve selected a very dramatic picture of Annecy to work on for my next project. I wanted to try out a wash with a reflection and this one was ideal. However, the subject was complex and I wanted to keep the style loose and the washes simple. I’ve manage to do this in parts but there is something not quite right about the result. It may take time before I can work out what it is that’s not clicking. I used winsor blue green and cerulean for the sky and water, with Prussian blue at the base. I like the sky, mountain, steeple and roof tops. The water works well but the buildings are doing something odd. The bridge is horizontal but taking a photo of painting like this is tricky.